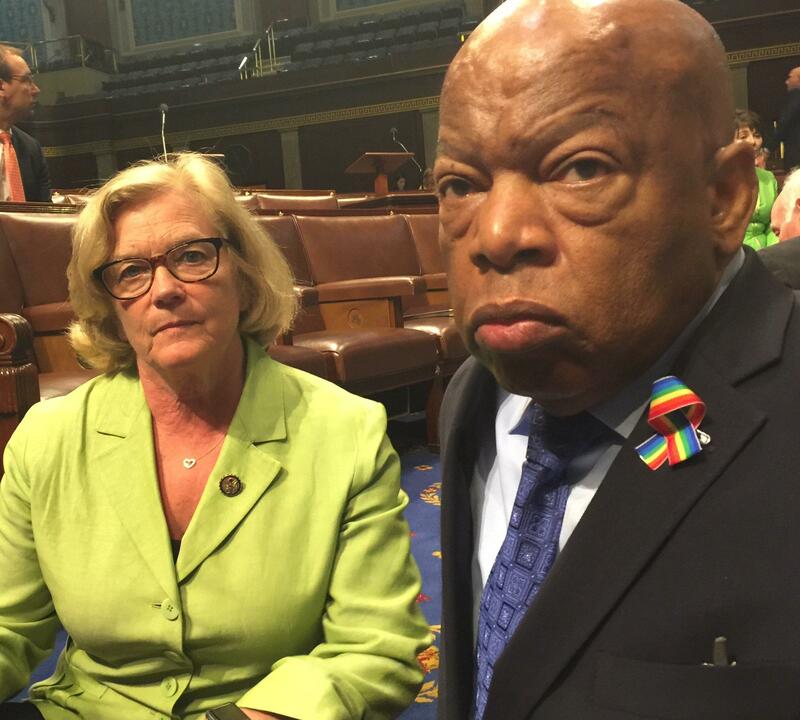 Rep. Chellie Pingree joins Rep. John Lewis in a House floor sit-in to demand vote on "No-Fly No-Buy" gun bill. The sit-in developed late in the morning after Pingree and a handful of other representatives demanded that House Republican leaders allow a vote on gun control proposals before breaking for the fourth of July recess. One by one Pingree and the other Democrats took to the podium to make their case. “Here we are, standing up for the millions of Americans who want Congress to do something, and honoring the lives of thousands of Americans who’ve lost their lives to gun violence. Here we are standing up for our constituents who are tired of the excuses and want to hear a debate and want to see us take action on gun violence,” Pingree said. The minority House Democrats are demanding a vote on legislation similar to proposals the Senate shot down early in the week – to expand background checks and to bar people on the federal terrorist watch list from buying firearms. After a fiery speech by Georgia Congressman John Lewis, a leader in the civil rights sit-ins of the 1960s, Lewis, Pingree and more than two dozen colleagues sat down on the House floor, prompting GOP leaders to call a quick recess. By late afternoon Pingree says the group included most of the House Democratic caucus. Speaking from a House cloakroom, she said she recognized that the majority party controls what will or what will not be taken up for votes. But she says frustration over the continued onslaught of gun violence has grown stronger than consideration of House rules - which unlike the Senate’s, do not allow for a filibuster. It’s unclear exactly how Republican leaders might respond, although their quick action to turn of House TV cameras may be an indicator. Pingree says she’s unsure of what the Democrats’ end-game might be; she’s just hoping for some form of agreement – and after the day’s remarkable events, she says anything seems possible. The offices of Maine Republican Representative Bruce Poliquin did not respond to request for comment.